This was both what I expected and not what I expected based on what I heard about the book when it came out and then again when the movie version came out. I expected it to be about a woman who was a confirmed foodie who loved Julia Child’s cooking and decided to try making all of the recipes in one of Julia’s cookbooks at the woman’s home in a year. What I didn’t expect was she had no real interest in cooking in general beforehand and certainly not in cooking anything as complex as the recipes in Julia’s Mastering French Cooking. I’m not even sure I can definitely say why Julie Powell started the project in the first place, even after listening to her book. She was having a crisis of …. what? Sort of a can’t figure out what to do with my life kind of crisis, I think. Julie Powell had just found out that she has polycystic ovary syndrome, and so her doctor recommended having a child soon if she was going to. She was working as a secretary temp at a government agency in New Jersey even though she and her husband had moved to New York originally for her to try to be an actress. She was going to turn thirty in just a few months. Suffice it to say, she felt her life had gone nowhere really in her twenty-nine years on earth. So she stole her mother’s cookbook and decided to cook each recipe in the next year. There seems to be no real purpose to this except to accomplish it. Which she did but not without lots of drama as would be expected in a kitchen as crummy as hers and without any more cooking expertise than she had. I admire that she persevered through this project when I would never have done so. For one thing, those of us who do not live in large cities would have had a heck of a time finding some of the ingredients. Even Julie had a hard time with some of them and she was shopping in New York. Plus the time involved in making most of the recipes is way, way beyond what I am willing to spend. I also admire her husband for his understanding and support given the expense as well as hours the recipes took. My husband would not be that understanding, nor would I if the shoes were reversed (so no criticism of my husband at all here). Plus she blogged about all of this as she did it, so kudos to her for all the time spent on the project. 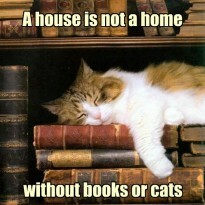 I can tell she is not a reader as I am, or she would never have given up all that time she could have been reading to cook. I have to wonder how interesting the movie is since I enjoyed the book but not enough to see a two hour movie about the same. 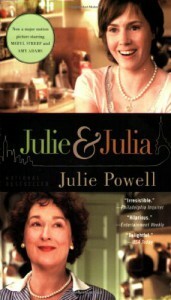 I’m quite sure Julia Child must play a much larger role in the movie than she does in the book since in the book she is only talked about. Overall the book was enjoyable if you like memoirs and cooking. I listened to the audiobook in which Julie Powell is the narrator, and she does a good job especially when relating the frustrating parts of the food prep. I learned one thing about French pronunciation. I have always pronounced crepe as rhyming with drape, but the French pronounce it as rhyming with step. And so that is how Julie says it which was very weird until I looked it up. I’ll stick with the English pronunciation I think.